The most revolutionary and advanced system of its kind in the marketplace today. • Lifelong performance and corrosion proof: All-polymer and Type 304 stainless design offers a lifetime warranty against rust and corrosion. • Strong and Durable: Strong as steel, MetroMax i™ shelves hold as much weight as Metro’s wire shelving and are impact resistant. Weight capacity for evenly distributed loads:800 lbs. (363kg) per shelf for lengths of 24" to 48" (610 to 1220mm) 600 lbs. (275kg) per shelf for lengths of 54" (1370mm) or longer 2,000 lbs. (907kg) maximum per stationary unit. • Easiest to clean and maintain: Smooth surfaces easily wipe clean. Polymer mats can be easily removed and cleaned in a sink or dish machine. Microban antimicrobial product protection is built into the high contact areas of the shelf including the mats, frames, and posts to protect the product from bacteria, mold, mildew, and fungus that cause odors and product degradation. Microban protection keeps the product "cleaner between cleanings". • Smooth, Protective Surfaces: Smooth, flat surfaces protect packaged shelf contents from unwanted rips, tears, or damage. • Robust Open Grid and Solid Mat Options: Open grid shelves promote air circulation and light penetration. One-piece solid mats contain spills and are ideal to protect items on the bottom shelf from dirt or backsplashes from cleaning floors. Shelf mats are sturdy and safely support concentrated loads from instrumentation and equipment. • Interchangeable: Part of the MetroMax iQ™ Storage System, corrosion proof MetroMax i™ shelves and posts are compatible with corrosion resistant MetroMax Q™ shelves and posts. • Efficient, Organized Storage: Premium MetroMax iQ™ accessories efficiently organize, contain, and compartmentalize all space between shelves. • Fast, Easy Assembly: MetroMax i™ assembles easily in minutes, without tools. Shelves can be adjusted at 1" (25mm) increments along the post. Shelf wedges have a window to locate your desired position. • Open grid and solid mat options. • Compatible for use on MetroMax i™ and MetroMax Q shelving units. • Weight capacity per shelf evenly distributed: 1,200 lbs. (544kg) on shelves up to and including 48" (1220mm) long; 900 lbs. (408kg) for shelves 60" (1524mm) long. • Dunnage shelves are recommended for use on units with four posts, not as part of an add-on unit with two posts. • Corrosion proof with built-in Microban antimicrobial product protection. • Compatible for use with MetroMax i™ and MetroMax Q shelves. • Stationary posts include an adjustable leveling foot to compensate for uneven floors. Leveling foot can be adjusted 1" (25mm). • When mounting a shelving unit to a dolly base, stationary posts are used. • Special height cut posts are available. 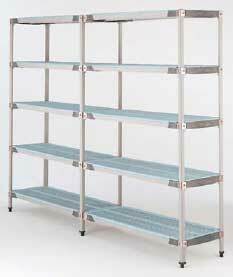 Use with MetroMax i stem caster posts and shelves to create a mobile shelving unit to meet your specific needs. Bumpers included. *Note: Rigid caters are held in place by a connecting channel. When ordering, shelf width must be provided. Innovative polymer stem casters offer corrosion resistance and enhanced durability. · All-polymer horn, stainless steel and axle and hardware, 5" (127mm) diameter polyurethane wheel, sleeve-style axle bearing and a optional toe-operated brake mechanism. · Recommended for all medium-duty applications. Used to "add on" one or multiple MetroMax i ™ storage systems while eliminating the cost of two posts per unit. Can be used to join units end-to-end, back-to-back, at right angles, etc. Two "S" hooks are required for each shelf. • 4- and 5-tier models available.